Why We Fight? Martin Gingras: Gracie Barra Blue Belt. 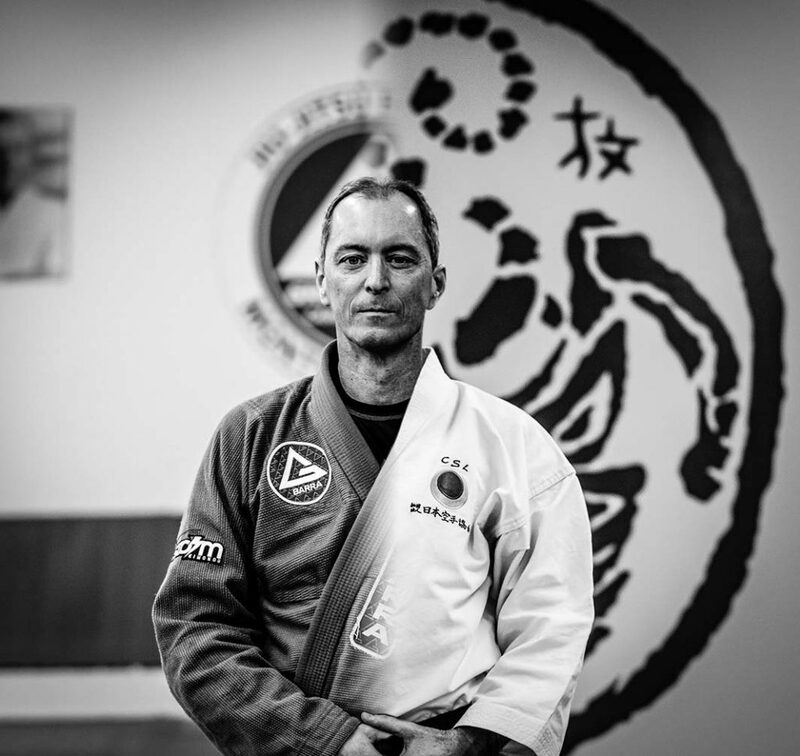 Featuring Martin Gingras: Gracie Barra Blue Belt. Dan Aponte: Martin, thanks so much for taking the time to talk to me. Thank you also for getting the go-ahead from your instructor, Stacy Ungar of Shotokan Karate Côte-Saint-Luc, who allowed me to watch and photograph you and Shelby practicing a very different martial art than I’m used to. Martin Gingras: Not a problem Daniel. It’s a pleasure to share some of my knowledge and experience of Shotokan Karate. DA: So, tell me a little bit about Shotokan Karate, and how it differs from jiu-jitsu. MG: So the first thing I would say is that the physical demands between Brazilian Jiu-Jitsu and Shotokan are very different. Shotokan is a very quick and explosive sport, where the purpose is to close the distance between your opponent very quickly, attack, and then get out without receiving any damage. The way I’ve come to understand jiu-jitsu is that you try and slow down the fight, control it, and take your time. This is what makes it like a chess match; you’re trying to solve the problem in front of you… or in my case usually on top of me! DA: It’s interesting is that you are now exposed to both martial arts, now that you’re cross training in them. Tell me a little bit about the history of Shotokan, I really don’t know much about any type of Karate. MG: Well, Shotokan Karate first emerged in Okinawa, where the people there were always under threat of invading forces. Shotokan was essentially developed to protect against invading Samurai. The mindset was one technique, one blow, one kill. Since the Okinawan people were severely mismatched in terms of weaponry, they had to use speed, technique and power kill or knock someone out. This is the premise behind Shotokan, which is why it is characterized by a few powerful hand techniques and a low fighting stances… This is the “Budō” of Karate, which means the “Way of War”. 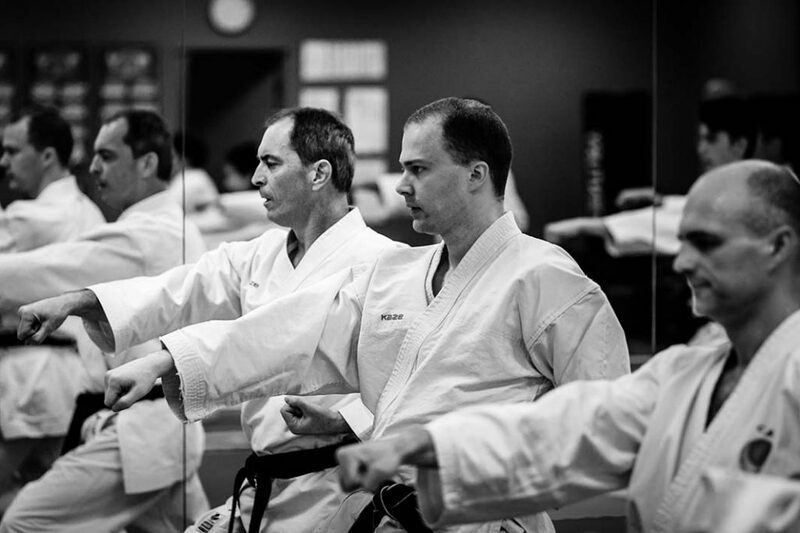 Over time, Shotokan was popularized in Japan and then later all over the world, and sport Karate developed. As such, all the dangerous techniques like eye gouging, hits to the throat and the groin, aren’t the focus, in order to make competition and continued practice of Shotokan possible. DA: Ok, so that makes sense and explains why Sport Karate is so quick, where fighters are moving in and out. In the past they were avoiding a Katana swing and trying to knock out the aggressor who was heavily armoured. You mentioned the progression of Karate to what is known today. There seems to be a similar shift, or at least some people think that a separation is beginning in Brazilian Jiu-Jitsu where you have “sport jiu-jitsu” and you have “self-defence jiu-jitsu”. Do you think that because of that shift and popularization, the essence of Karate has changed? MG: Well, one great aspect of this shift is that modern Karate is available to a broader audience; anybody can practice it. Children can start Karate at a young age, and they won’t be poking each others’ eyes out. Older people can also start Karate and maybe choose to focus less on the “Kumite” (sparring), and more on the “Kihon” (basics) or the “Kata” (form). And its similar with jiu-jitsu: there was a time when jiu-jitsu was super rare, there weren’t too many schools, and if you ever heard of or knew of a Brazilian purple belt who was teaching this was a rare find! 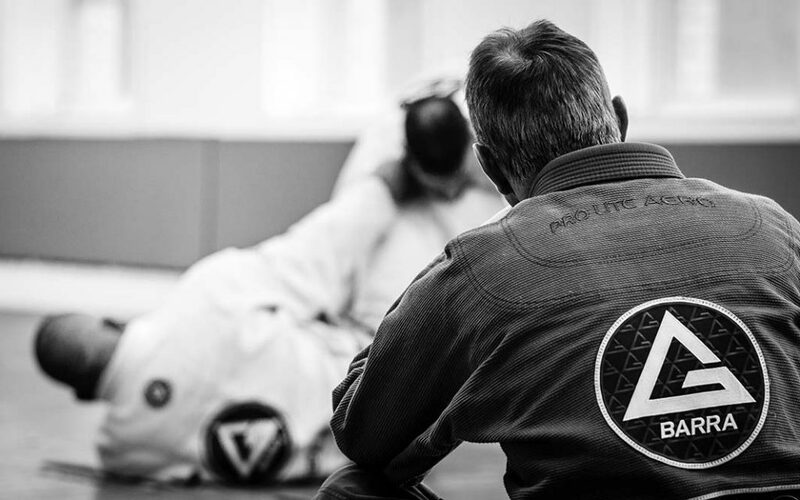 Now as jiu-jitsu has become popularized and recognized as an effective martial art and sport, it’s become more accessible. Gracie Barra for example, if I remember correctly, has somewhere around 800 schools*. And so I’ve trained in London, I’ve seen schools in San Francisco and Toronto; there’s always a place you can go to train, which is very very nice. I was interested in Jiujitsu because it was like a “forbidden fruit”; Karate’s focus is striking, and so you’re taught never go to the ground and always keep the fight on your feet! DA: So how long have you been practicing Karate? MG: I’ve been practicing Shotokan for the past 10 or 11 years now, but when I was younger, I also practiced for a good 10 years or so, which makes a total of about 20 years now. The reason I started back up again is because when Shelby was 6, I signed him up for Karate and sat down and watched his first class. The next time we came in, I had a gi and was ready to start again! DA: Quite often, it’s very difficult for people to accept different schools of thought, especially if you’ve been practicing something for a very long time. What is it that interested you or made you want try jiu-jitsu? MG: So quite a few years ago, I tried a jiu-jitsu class at another school. I was really starting to get into it, when I came across Gracie Barra by happen stance. So I figured I’d try it out and see what a different school, one that solely focused on jiu-jitsu, was like. During my first class, I remember being blown away by the level of teaching, the attention to detail, but also the friendliness and the welcoming atmosphere. The location was also a bonus since I live close by! And it’s not to say that the other school isn’t a good school, but it isn’t a pure jiu-jitsu school, it’s an MMA gym. 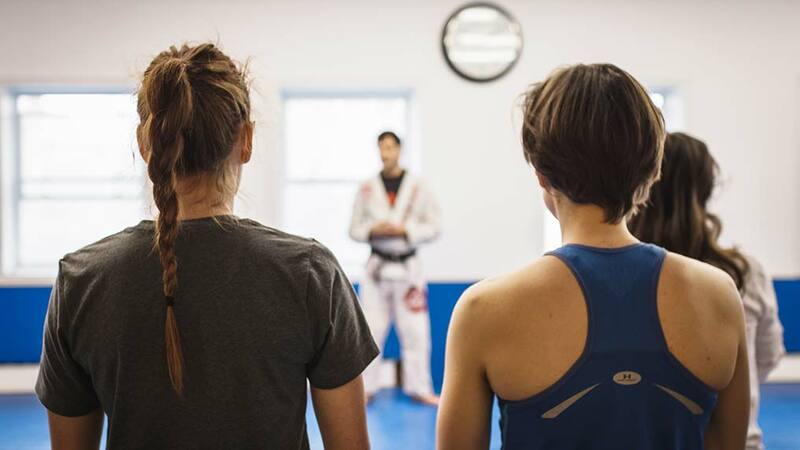 I am really interested in jiu-jitsu proper, and that’s why this place is such a good fit. Now, the question of why I was interested in jiu-jitsu is actually pretty funny. I was interested in Jiujitsu because it was like a “forbidden fruit”; Karate’s focus is striking, and so you’re taught never go to the ground and always keep the fight on your feet! Our instructor, used to do free-style wrestling, and so once in a while, we would do a little bit of grappling. But still, we were told not to go to the ground, because its bad, unsafe, etc. And so I think that’s what it was, I was attracted to it precisely because I was told not to do it! We’ve learned some simple takedowns and some basic grappling type things, but we really don’t do very much real grappling. What I’ve realised, though, is that striking and grappling compliment each other in many ways. Together they are much greater than the sum of their parts. Sometimes when I’m sparring at Karate, I might get into a bit of a scuffle, quickly get to the ground but it doesn’t last long. I see things differently now; I see opportunities that I didn’t see before, and I notice dangerous grappling mistakes that I never even knew were there. Martial arts are physical, but there is a constant learning aspect to them as well…So I love that knowledge and intelligence are assets in martial arts. DA: So Martin, you’ve not only been practicing jiu-jitsu for a couple years now, you’ve also been practicing Shotokan for about 2 decades. What is it that keeps you going and attracts you to martial arts so much? Why do you fight? MG: Honestly, I just love the intensity of it. I like that in jiu-jitsu there’s a huge problem-solving portion to it, like every round you’re trying to solve a changing equation. I mean, jogging is nice, biking is nice, but there’s nothing to solve there, there isn’t anything that keeps me interested and captivated. Martial arts are physical, but there is a constant learning aspect to them as well. I really like how experience and proper technique are critical; you can be young and fit but without proper technique you just aren’t very effective. So I love that knowledge and intelligence are assets in martial arts.